Wow – this month is just flying by. We still have to go get our pumpkins and carve them up; this is one of my favorite parts of Halloween. According to legend, long….looooong ago there was an Irishman known as Stingy Jack. Stingy Jack was a miserable, old drunk who liked to play tricks on everyone: family, friends, his mother and even the Devil himself. One day, he tricked the Devil into climbing up an apple tree. Once the Devil climbed up the apple tree, Stingy Jack hurriedly placed crosses around the trunk of the tree trapping the Devil high in the tree. Stingy Jack made the Devil promise him not to take his soul when he died. Once the devil promised not to take his soul, Stingy Jack removed the crosses and let the Devil down. Years later, when Jack died he went to the pearly gates of Heaven and was told by Saint Peter that he was too mean and too cruel and had led a miserable and worthless life on earth; therefore, he was not allowed to enter heaven. So he journeyed down to the gates of hell to demand his due. Wouldn’t you know it, the Devil kept his promise and doomed Jack to wander the earth for all eternity with only an ember of hellfire of to light his way. Thenceforth he was known as Jack O’Lantern. On all Hallow’s eve, the Irish hollowed out Turnips, rutabagas, gourds, potatoes and beets. They placed a light in them to ward off evil spirits and keep Stingy Jack away. 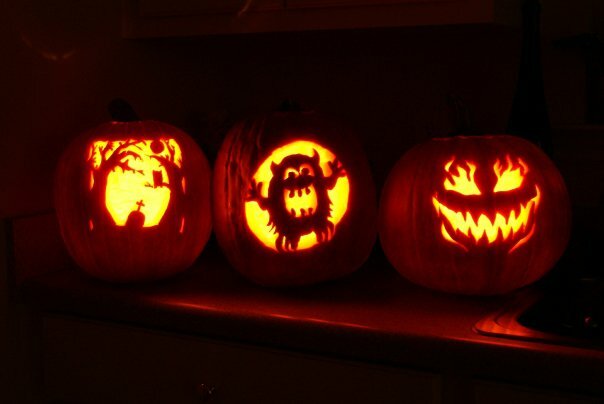 Here are the pumpkins we carved a couple of years back. I think they did the trick and kept Stingy Jack at bay. This was my baby – traditional face with a little zing to it. This was Jason’s. The tree branches were a real bugger since the limbs were so thin. And this was a joint effort by Jason and I, for our little monster (JBear). 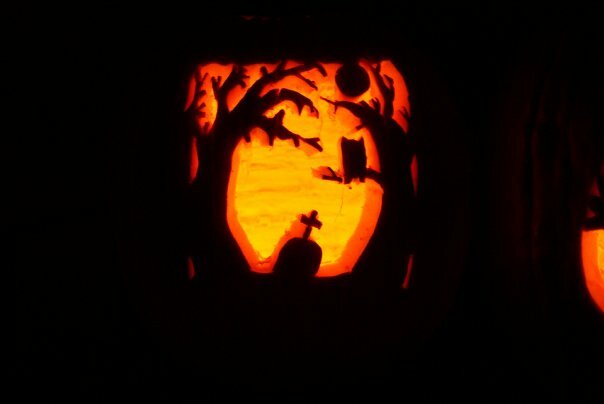 Can’t wait to carve this year. Will it be traditional or something a little more creative, stay tuned. 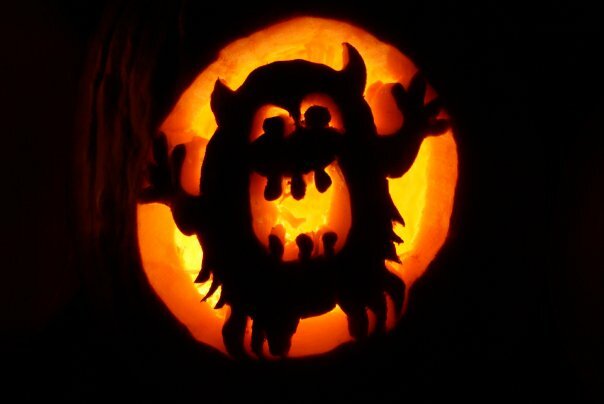 Do you partake in the pumpkin carving fun? 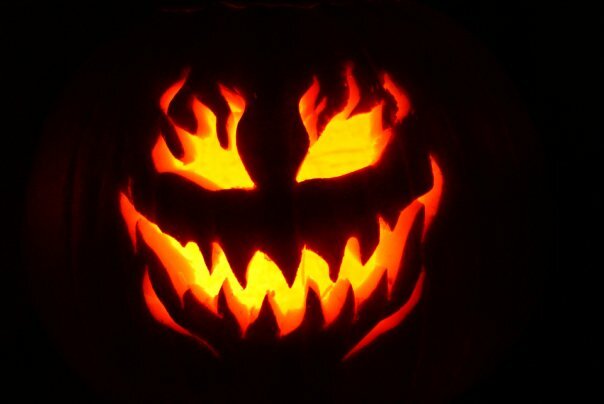 This entry was posted on Tuesday, October 23rd, 2012 at 10:32 am	and tagged with creative, devil down, gates of heaven, gates of hell, halloween, jack-o-lantern, legend, pumpkin, pumpkin carving, stingy jack, story, tradition and posted in Holidays. You can follow any responses to this entry through the RSS 2.0 feed. « New Week. New Attitude. We still need to get pumpkins for carving too! Should have done it last weekend!